I wasn't sure, at first, whether I liked the butterly images in the Butterfly Gala Bundle. Now I am sure - I LOVE them! The photo doesn't show off the gorgeous shimmer of the butterflies. For these beauties, I black heat embossed the images onto some of the gorgeous Grapefruit Grove Foil (that I got FREE from the Sale-A-Bration Brochure with a $90 purchase - see how to do that here). Before punching out the butterflies (TIP: save card by stamping in a horizontal strip), I coloured them in places with Stampin' Blends alcohol markers in Dark Lovely Lipstick and Dark Bermuda Bay. The greeting is stamped with Lovely Lipstick ink and the label dies are part of the Frosted Bouquet Framelits set. 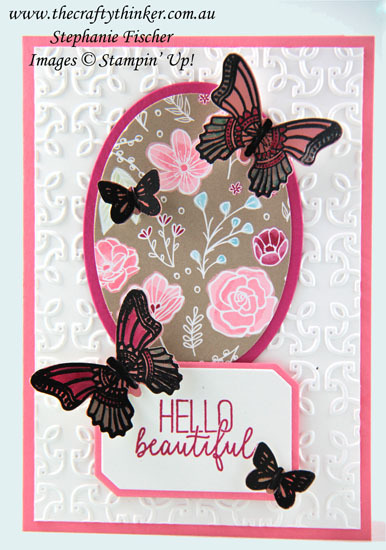 The base card is Flirty Flamingo and the white layer is embossed with the Garden Trellis Embossing Folder. The Lovely Lipstick oval layer and All My Love Designer Series Paper are cut with the two largest Layering Ovals Framelits. TIP: For extra dimension, fold up the butterfly wings and pop mini dimensionals underneath the wings and glue dot in the centre to adhere to the card.